Railway RRB Group D Exam is also conducting today i.e. 5th November 2018. There are 62,907 vacancies for the Railway Group D posts. RRB Group D exam is taking place in three shift 1st (9 AM),2nd (12:30 PM),3rd (4 PM). This article covers the questions asked and expected cut off up to level candidate should attempt. Our AffairsGuru Team is not leaving any stone to analyse the Railway all shifts. All the aspirants who have still next shift exam, they can get clear idea about the exam pattern and difficult level. Candidates will also able to get PDF. 8 Railway Or RRB Group D Exam Analysis 5th November 2018 2nd Shift. Exam will be Bilingual (English & Hindi). Aspirants can check the Railway or RRB group d exam pattern below in tabulated form also. Below is given the Railway / RRB Group D Exam analysis. Good attempts that need to do for chances of clearing this exam and appearing for second CBT. The level of Railway Or RRB Group D Maths was Easy-Moderate. Below are some maths questions asked in shift 1st. The level of Railway (RRB) General Intelligence & Reasoning was Easy to Moderate. Below are some question asked in Shift 1st. 8. One question was related to White House. 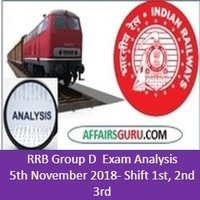 Railway Or RRB Group D Exam Analysis 5th November 2018 2nd Shift. Below are some questions asked in 2nd Shift of 5th November 2018. 2. If Income of a man is increase by Rs.2400, then his income become 1100/7% , Find his primary Income ? 5. Who is the governor of RBI (Reserve Bank of India )?- Urjit Patel, RBI was established in 1935 in Kolkata. 6. One question related to Indian Navy. 8. Who is the founder Human Development Index (HDI) ?- It was prepared by Mahbub ul Haq in 1990. 9. What is the name of Virus of AIDS(Acquired Immuno Deficiency Syndrome) ? Below are some questions asked in 3rd Shift of 5th November 2018. 3. If compound Interest Rs. 420 on a sum of for the 2nd year at the rate of 5%, Then find the Principle ? 8. One questions related to the Brand ambassador ? RRB or Railway Group D Exam 5th November Shift 1& Shift 2 and Shift 3 is over now. So, it’s time to share your experience with the exam as it will help you know bits and parts of the exam. Share your Share your RRB Railway Group D Exam Review and know where you stand among thousands of aspirants who appeared for the exam. And if you remember any questions or the type, share it with us.